How Did Cranford Get Its Name? The Township, located in the heart of Union County, was incorporated in 1871, formed from portions of the Townships of Clark, Linden, Springfield, Union and Westfield. Through the years the business district and neighborhoods sprang up around the train station and the Rahway River. Today, the downtown, the river, and the train station remain valued amenities to more than 22,000 residents in the four square mile township. By 1885, there were 76 residents commuting daily from Cranford to New York City. Today, over 1,000 people take the train every day from Cranford’s Train Station. Learn more fun facts about Cranford’s History and Notable People by visiting the Cranford Wikipedia Page. Visit our photo gallery for some great vintage Cranford pictures. Have vintage pictures you want to share? Send them to us at [email protected] We’d love to add them to our gallery. Cranford is a close-knit community where many of its residents are actively involved in schools, sports, civic and community organizations. The Township is proud of its recreational facilities that include two outdoor pools, an indoor pool and fitness complex, bike path, canoe club, tennis courts, sports fields, and parks. Cranford has a first-rate K-12 school system. 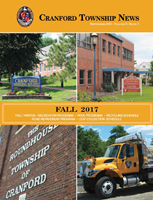 The Township operates under a Committee form of government with five commissioners elected at-large for three-year terms. The commissioners decide who will serve as mayor and deputy mayor for a one-year term. Four of the commissioners have oversight assignments for the various departments and municipal operations. The Township is managed on a day-to-day basis by the Township Administrator and department heads.